I love the vinyeards. They have all been recently snipped and pruned and trimmed, looking neat and well coiffed. Their stark woody trunks, attractively darkened by the rain, are given center stage in settings of gay springflowers. I did several sketches. The first ones are still waiting for the art fairy to make them presentable, like Casey always says… These are of the last ones, after I started realizing I cannot fit a whole vinyeard onto my page! I always find nature intimidating, thinking I can create the whole universe on a single page. …”It’s elementary my dear Ronell, simplify, simplify”…. All sketches done in pen and watercolour on Fabrano Artistico watercolour paper. It looks like you got out on one of the few sunny days we’ve had! These are beautiful! OH YES!!! Wouldn’t I LOVE to be there!! It’s a fabulous place and you captured it gorgeously — filled with light, romance and the promise of all those vines! These are beautiful. You make it look so inviting. Are these yours? and do you make wine? Gorgeous splashes of colour, as always … When I browse the EDM Superblog, your work is so distinctive, I immediately recognise it as yours. You are not the only one to find nature intimidating! Yet she always inspires beautiful work from you, Ronell. 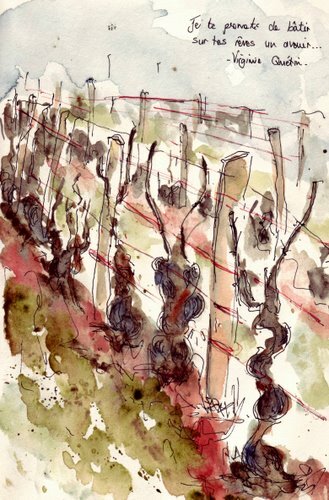 I love your vineyard – particularly that first watercolour. 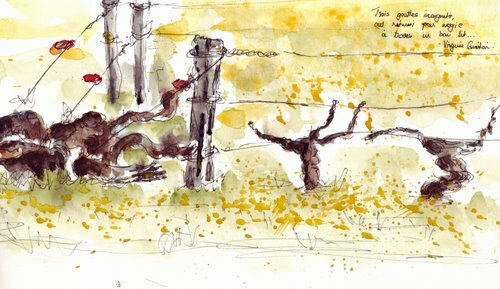 I take heaps of photographs of vines but I’ve never been brave enough to sketch them – so there! 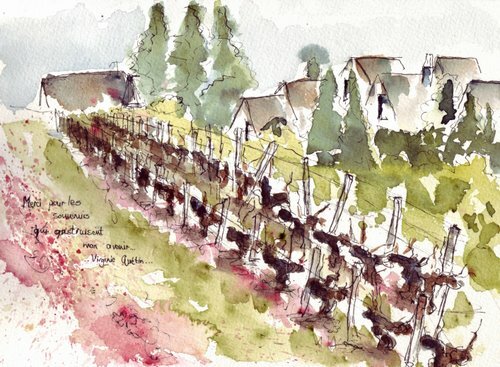 Oh how glorious, I think I will trek over to our local vineyard and do some sketching too. Don’t know what all you tried to fit in there on the others but these are great! I love the vineyards too! Ronell, these are georgous!! like the others you make me want to head out to the vineyards!! again beautfiul!!!! What a lovely glimpse into your part of the world! Beautiful sketches Ronell, thank you. I totally agree with you regarding your feelings before nature. So overwhelming, how can one dare think it will be possible to capture it in a tiny sheet of paper. But somehow, you always seem to succeed. These are beautiful sketches. I love the color choices in these. Very beautiful line work too. You always manage to capture the atmosphere of a place Ronell…These are wonderful. Your drawings look ready to burst forth in bloom just like the vines you painted! Ronell, you’ve captured the beautiful mystery of spring.